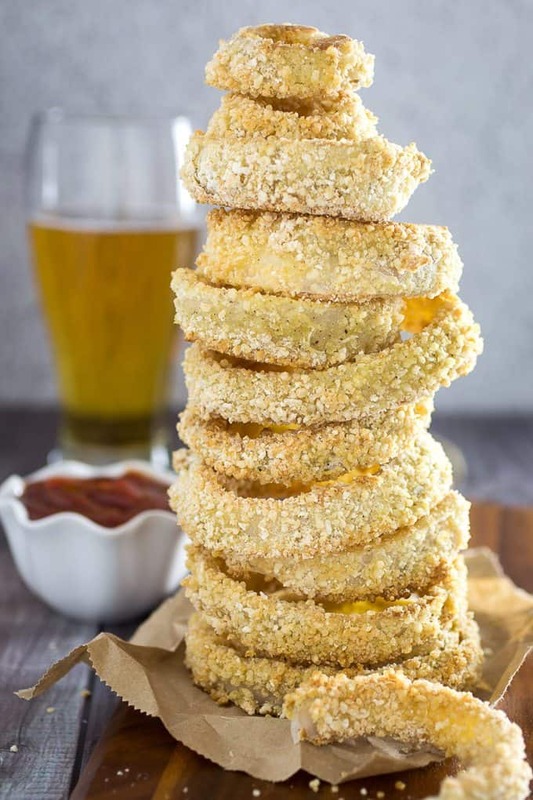 Crispy Oven Baked Gluten Free Onion Rings are a lighter, gluten free version of your favorite pub food. Onions are dipped in gluten free flour and breadcrumbs, and combined with garlic, salt, pepper, and a kick of cayenne. Then they’re lightly sprayed with olive oil, and baked to perfection. It’s the perfect guilt-free snack! There’s nothing quite like sitting down with good friends and good food. 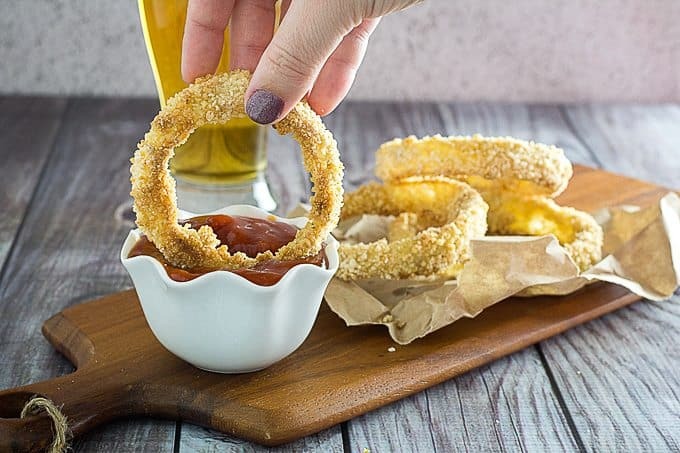 And for me, these Crispy Oven Baked Gluten Free Onion Rings really take me back to going out to a restaurant or the local pub with friends and splitting a plate of appetizers. But these have a great twist to them! Not only are they gluten free, they’re also baked in the oven instead of fried in oil. 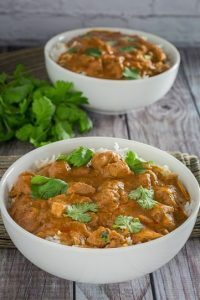 It cuts the calories down, while keeping all of the crispy texture and great fried-onion flavor you’re craving! Even though I’m doing my best to eat healthy now (and succeeding, so far! ), I’m still craving certain foods. 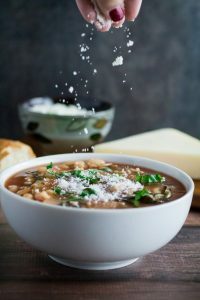 Namely, anything super salty and crunchy. It’s my kryptonite. My Achilles heel. Put me in front of a bag of chips, and I will polish the whole bag off with no problems. Cake? Eh, I’ll enjoy it, but I could take it or leave it. Give me a deep fryer. 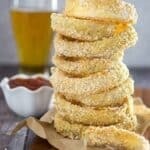 But these gluten free onion rings, on the other hand, completely satisfy that craving! Maybe it’s the super crispy texture. Or, it’s the combination of garlic, salt & pepper. 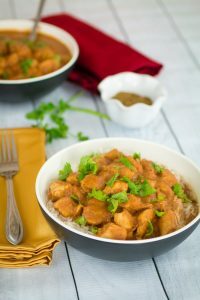 It might even be the perfect little kick you get from the cayenne pepper. 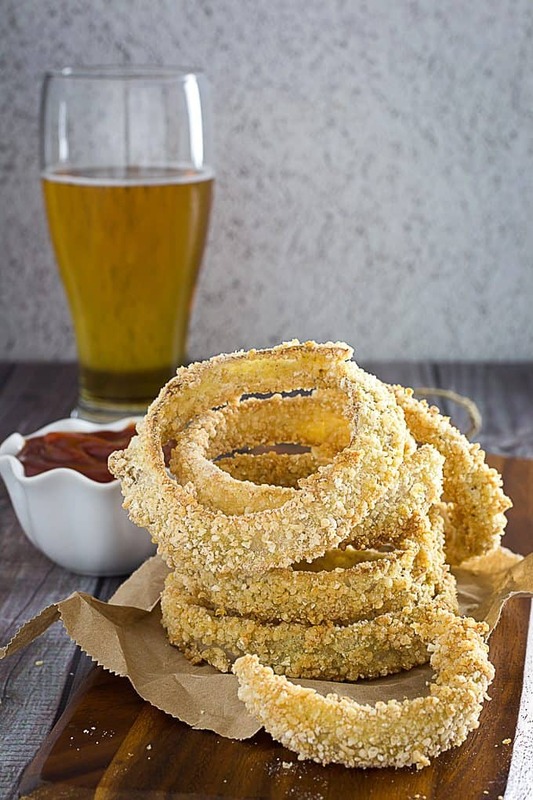 Not enough to call them spicy, but definitely enough to add some great flavor to these gluten free onion rings. Or, maybe it’s because I can eat a giant handful of these without feel guilty about the calories! They are little bit carb-y, but that’s not always a bad thing when you’re tackling the kind of workouts I’m doing. Will they match up to something like a sweet potato? No. But will I enjoy these way more than a sweet potato? Yes, yes I will. Either way, they’re pretty much exactly what I was looking for this week. Did I mention how crispy these gluten free onion rings actually are? No, I’m serious. They’re crunchy little rings of deliciousness. They almost didn’t make it through an entire photo shoot, because I temporarily lost control of my hand-to-mouth coordination, which caused me to eat about half of them. It’s a real thing, I swear! 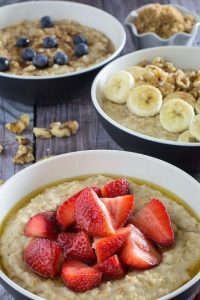 The key is to find a brand of gluten free breadcrumbs that you really like the flavor of, and spray them with just enough olive oil to make the heat of the oven really crisp them up. If you’d like them extra crispy, you can even flip them over half way through cooking and spray the other side. But I’m pretty happy with how these came out as-is. Also, I’m a little but lazy today, so I took the easy route. Either way, they turned out awesome. And I would totally serve this as an appetizer for my next board game night! If you’re looking for another great appetizer for a party or game night, you might also want to check out my spinach balls. I always get rave reviews about them! 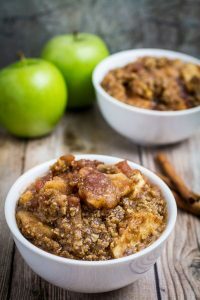 If you can’t find gluten free breadcrumbs (or you just don’t want to pay the gluten free up-charge), you can totally make your own. 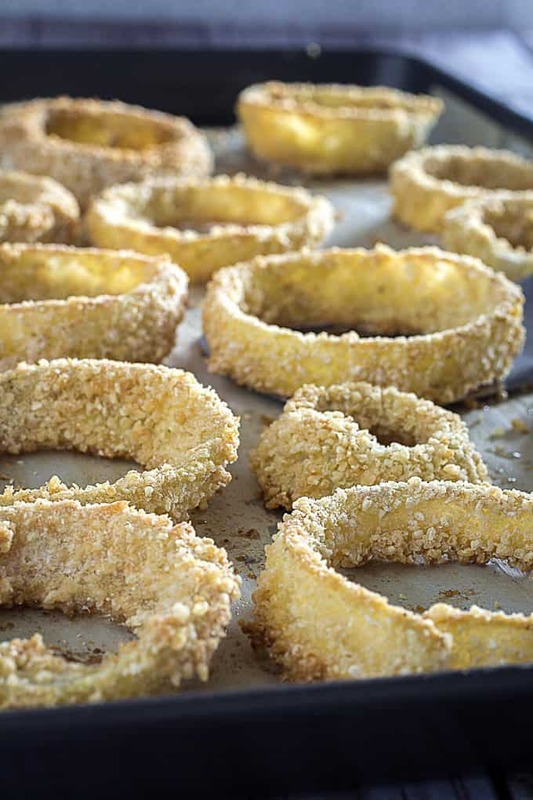 Pro Tip For Gluten Free Onion Rings: Cereal Breadcrumbs! Take your favorite plain GF cereal and put it in the food processor until it looks like crumbs. Think really plain, like a basic corn or rice cereal. Personally I think sugar would be a little strange with onion, but if you’re digging it, I won’t judge you. Then just proceed to bread the rings as usual. It’s so easy! 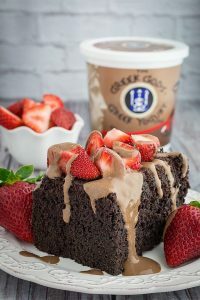 Now if you’ll excuse me, I still have about half a pan of these sitting in the kitchen, and they are calling my name! 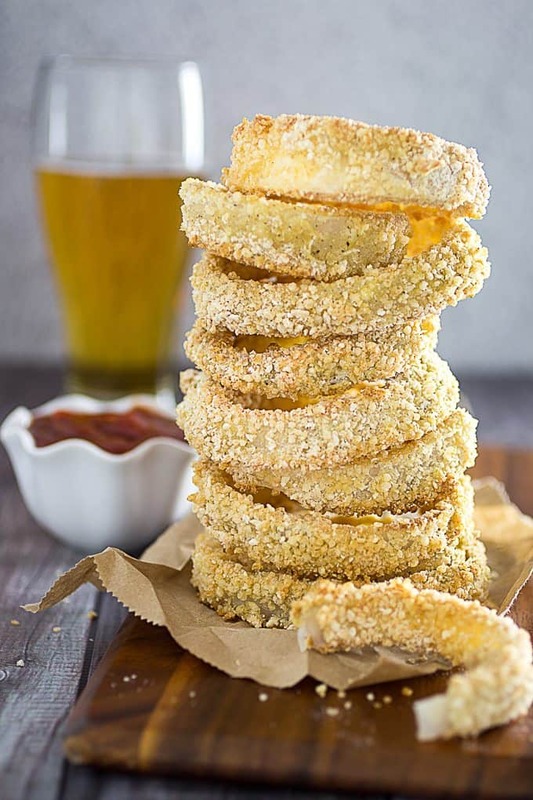 Crispy Oven Baked Gluten Free Onion Rings are a lighter, gluten free version of your favorite pub food. Onions are dipped in gluten free flour and breadcrumbs, and combined with garlic, salt, pepper, and a kick of cayenne. Then they're lightly sprayed with olive oil, and baked to perfection. It's the perfect guilt-free snack! Preheat oven to 450°F. Grease a large baking sheet. Place onion rings in a large bowl and fill with water until just covering onions. 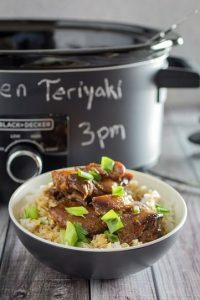 Place three bowls in a row. In the first bowl, combine gluten free flour, garlic powder, salt, pepper, and cayenne pepper. In the second bowl, whisk eggs and milk together. In third bowl, add breadcrumbs. Take one onion ring from water, shaking to remove any excess. Dip into flour until completely covered. Shake again to remove excess. Dip onion ring into egg mixture, coating completely. Then coat with breadcrumbs. Shake lightly to remove excess. Place onion ring on baking sheet. Repeat for all onion rings, leaving a little bit of space between each ring. Spray onion rings lightly with olive oil. Bake for 15-20 minutes, or until golden brown. *If you don't have a large baking sheet, you may have to do this in two batches. 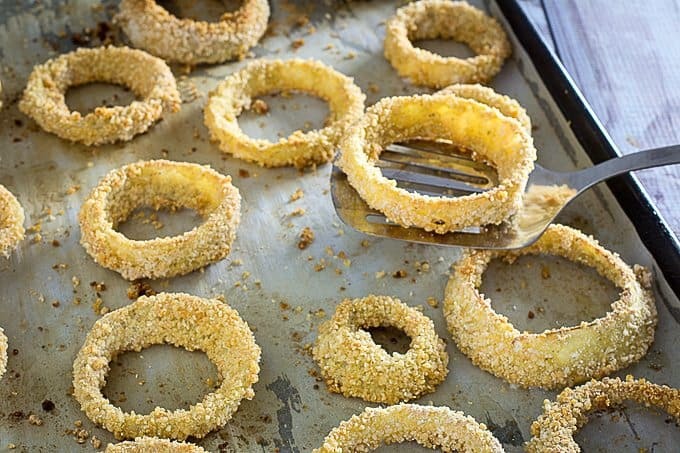 These onion rings looks insanely crispy and delish! 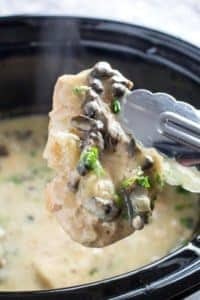 I never knew you could make them gluten-free, thank God I know now!